The artistic director for Metropolitan Ballet of Tacoma, Damaris Caughlan, was so gracious to have me to be their live auction model for the dance company's yearly auction. My favorite item to auction item to model - a Seahawks football helmet autographed by Line Backer Lofa Tatupu and Linebacker Aaron Curry. Go Seahawks! Here are a few of the company's dancers performing a dance number from their upcoming "Celebrate His Birth" performance. For the past three years my husband and I have coached NFL Youth Sports Alliance Flag Football with Tacoma Metro Parks. It is so much fun to see these boys develop not only their playing skills but their social skills as they learn about the camaraderie of a team sport. I just love these boys!!! My cubbies are kicking off the year with our annual popcorn fundraiser to help pay for awards, activities and camps for each boy. 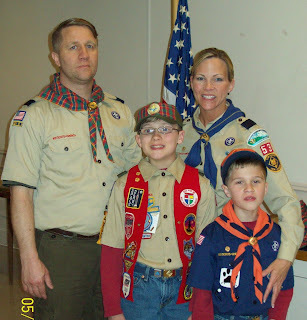 At this meeting, I also was officially appointed the position of Cubmaster for the Pack. Since then, we have now recruited another 20 or so boys and still counting. It looks as though we will have at least 50 cubbies in our pack this year! My boys are busy helping collect and gather school supplies at our local Dollar Tree for the Wounded Soldier's Families stationed at Madigan Hospital of Fort Lewis Army Base. 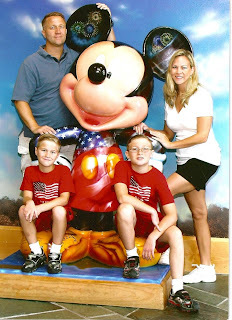 As a volunteer for Heartbeat Serving Wounded Warriors, I am blessed to have two loving boys who are always willing to lend Mommy a hand when it comes to helping our military families. 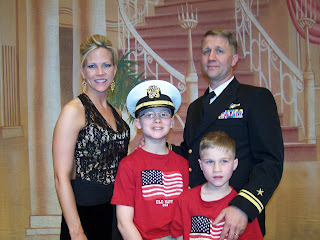 They know firsthand the challenges and sacrifices children face being a dependent of a Military Soldier. We collected approximately 1,000 school supplies. I am such a proud Mommy! 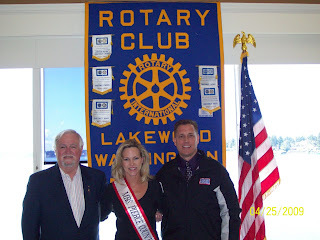 I was honored to be a guest speaker at the Gig Harbor Women's Republican Club advocating for our military families. 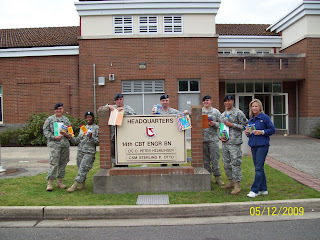 As a volunteer for Heartbeat Serving Wounded Warriors, I am able to help make a difference by promoting support for our wonded soldiers and their families. 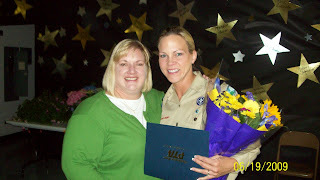 Our Idlewild Auction Guru - Kimberly Holmes - presented me the prestigious 2009 Washington State PTA Golden Acorn Award in recognition of outstanding dedication and service to children. 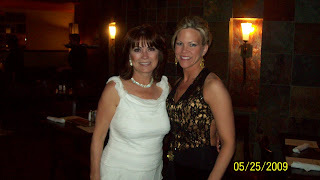 I am now an official "Idlewild Diva" with my name written in my son's school hall of fame! What a huge honor and very humbling to be recognized along the side of such dedicated PTA volunteers. 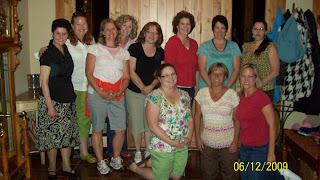 Here I am with my PTA family made up of the most talented and dedicated women I have ever had to pleasure to work with. Not to mention the wonderful friendships I have made while making a difference in our children's lives. If you are a parent - I encourage you to join your child's PTA and be blessed! 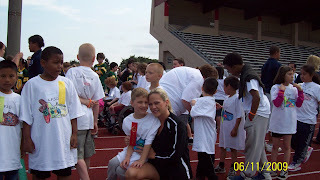 What a priceless day I had with my son Cody and his classmates at the annual Clover Park School District's Special Olympics Track Meet. 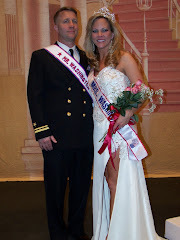 Pageant Director Pamela Curnel - the lady who makes this all possible along with her devoted husband Dr. David Curnel. She is truly an amazing woman! 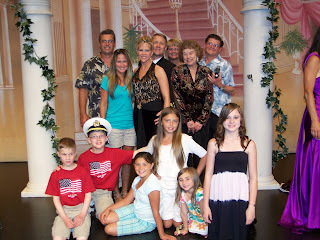 few of my family members - I am so blessed. 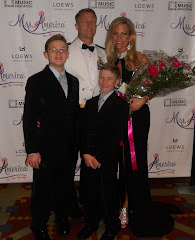 Being a Military Wife, this is my favorite pageant event of the year as we take time to remember and honor those that have served defending our great nation. My pageant sisters and I are anxiously waiting for the parade to start. It is so much fun seeing all the adorable children along the route. What a great time! 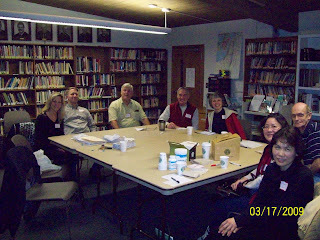 My son Cody attends a functional academic class for children with special needs. As their room parent, I am touched by what makes these children so "special". What you see is what you get with these children - they have such an sweet spirit and innocence about them - and they say exactly what is on their mind. It is refreshing and humorous to say the least! I just had to post this! My son Kenny decided to ask his friends to bring food instead of gifts to his 11th Birthday Party. We invited 30 of his friends to his Lazer Tag Party and collected over 250 food items! 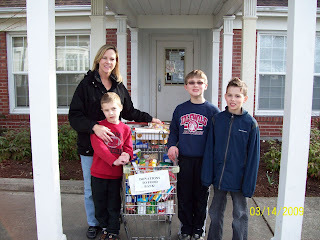 This is a picture of us dropping off the full basket of food to our local food bank. I am so proud of my boy! 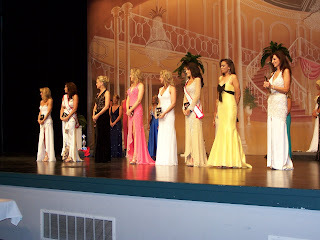 In May, I hosted the crowning of Little Miss Idlewild by Mrs. Washington America 2008 Marikay Coyer. This was one of the highest bidding live auction item for the Idlewild Elementary Annual School Auction - it went for $600.00! My husband and I belong to a support group for families affected by Tourettes Syndrome. By being a member of this support group we are able to better equip ourselves to being the best advocates possible for our son Kenny who has been diagnosed with Tourettes Syndrome. 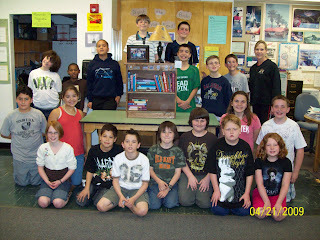 As my son's room parent, I helped the class build, stain, decorate and collect books for their classroom auction project to raise money for school programs. 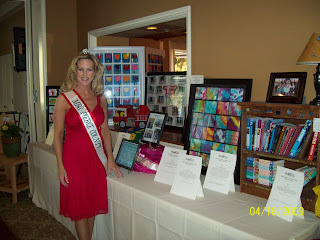 Our project was the highest bidding classroom project at the annual Idlewild School Auction and went for $550.00! Putting the final touches on the Live Auction Table before the auction begins! 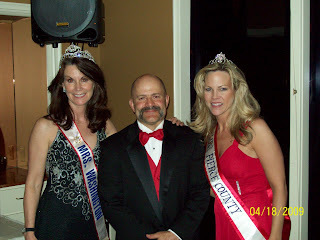 Mrs. Washington 2008 Marikay Coyer, Auctioneer Mike Randall, and Mrs. Pierce County Carla Richards - We raised almost $20,000.00 this night helping to pay for programs, supplies, and field trips for children attending Idlewild Elementary School. In April I was busy collecting signatures for MENC (National Association for Music Education) at the annual Idlewild Elementary School Auction to help keep music and art in our schools. 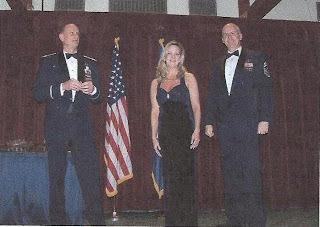 January 2009 I was awarded the distinguished Bryce Lilly Service Award from the Head Commander of McChord Air Force Base recognizing my efforts in making a difference in the lives of our military families. 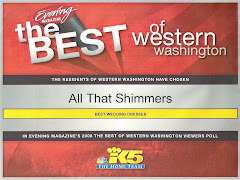 This is the highest service award of the year to be presented by the Wing Commander during the annual awards banquet. I was awarded a beautifully hand carved replica of a C-17 Globemaster mounted on a wooden base with my name engraved on a brass plate. I am still in awe! 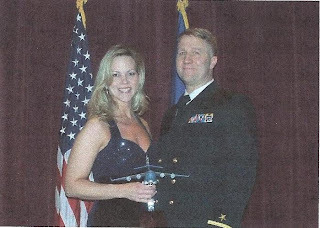 My husband served on the C-17 with the Air Force and now I have one of my very own :)!